This website has a number of purposes. The first is to convince you that you should be growing your own food, and the second is why you should be growing that food using organic methods. I travel the world talking to farm and garden groups about why this is important. I have made trips to the Czech Republic (shortly after end of the Soviet Bloc), to Belarus (in 2013). In September 2015, I did a lecture tour in China’s Sichuan and Yunnan provinces and visited a number of research and botanic gardens. I kept as good a blog as I could, considering the hectic schedule and the state of internet connectivity in rural areas. Especially check out the photos from the many food markets I visited; that was one of my favorite parts of the trip. So, why should you be growing your own food? Well, there at least seven reasons that pop to mind right off and we have listed them for you on a page we think aptly titled: Why Bother? While we are often considered one of the wealthiest and healthiest countries in the world—given that wealth is measured in dollars, and health purely in terms of life expectancy, and both are seen solely in broad aggregate measure—when we examine the issue in greater detail, and with a bit more nuance, the picture is not so grand. Both of those simplistic measures hide problems that, while perhaps not as blatant or urgent as those in less developed countries, are nonetheless significant. Income disparity in the United States is growing, and the percentage of the population below the official poverty level is increasing. Meanwhile, though infectious diseases are less prevalent than in many parts of the world, the incidence of metabolic and diet-related diseases such as cancer, and especially diabetes, is rising dramatically. And while the percentage of income spent on food is lower in the United States than most other countries and malnutrition lower, the highly processed, industrialized nature of the food supply – a result of the “cheap food policy” of the late 20th century – is thought by many to be closely tied to those health problems. One researcher, in fact, posited that all we have really done is traded third world diseases for first world diseases. There is widespread belief among critics of the current food system, as well as enlightened USDA personnel, that de-centralization, de-industrialization and de-commodification of food production will lead to production of foods that are inherently more nutritious, not to mention less expensive, less damaging to the environment, and more socially just, throughout the food system. And decrease food miles, as well as the social distance between farmers and consumers. Regionalizing and localizing commercial food production both move in this direction, but perhaps the most radical action in regaining what might be called the “freedom of food” is the re-establishment of self-sufficient food production. In our modern world this will take the form of backyard fruit and vegetable production, and the establishment of community gardens in urban and semi-urban areas. Unfortunately, many of the skills of food production have been lost to a large portion of the US population over the past 50-100 years. But with the establishment of the internet in the last 10-20 years, a radically easy and inexpensive way to redistribute this traditional knowledge – and its modern outgrowths – has become available. Okay. But why should you be growing your own food organically? 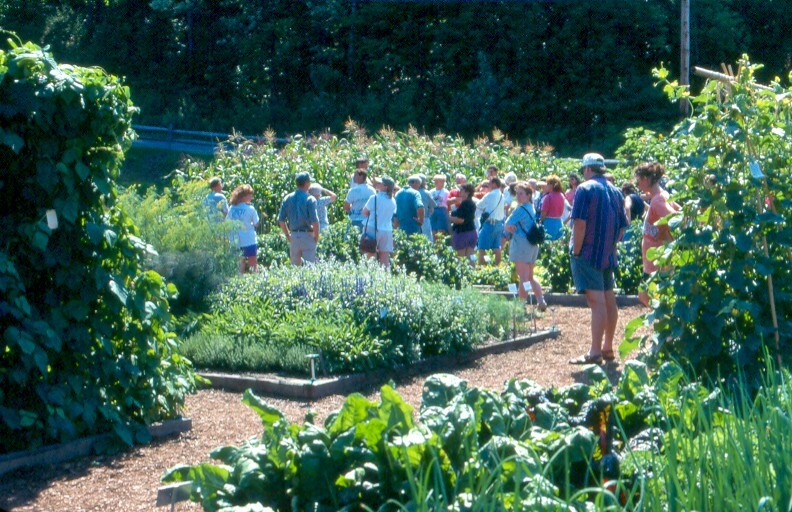 Throughout the site (and the Garden Smarts blog) you’ll find links to the foundational, and the latest research about why organic food is superior, and why growing organically – whether in a home garden or on the farm – is more environmentally responsible. To ground you in the heart of organic, we have provided a page outlining six key principles of organic food production. Keep these in mind and you’ll have a guide to your own gardening that will help you resist the temptations of the four-color bag merchants of pay and play gardening. Perhaps you say to yourself: “I don’t know the first thing about gardening…I have a brown thumb.” Well, that is what most of this site is about: how to turn your brown thumb into a green thumb (we think it was green all the time, but that is another discussion). To help you do that we have a complete guide to garden design, garden planning, and garden maintenance. We also have an extensive list of Crop Guides that you can access here on the main site, or from your smartphone, or tablet, by visiting our companion site at gardensmarts.mobi so that you can refer to our ground-tested tips and tricks while you are actually out in the garden. For a little more depth you can check out this YouTube from a lecture series I gave in Shepherdstown, WV a few years ago. Sorry there is no audio, but I am converting the whole series into a free downloadable book. If you would like to be on the list to receive a copy of the free book on organic principles when it is finished, email me at Bakerton Books and I will put you on the distribution list. This list will only be used to notify you of new book releases. To receive regular updates on this website, you should Subscribe to Garden Smarts by Email. Hey Shep, Yes I do grow my own food-organic of course-and I also started raising turkeys about five years ago. I am overwintering Narragansette Heritage Turkeys and they have eggs. I have no idea if they will hatch or not. The reason I am contacting you is to request support, and possibly information about starting to spread the use of organic cloth grocery bags in Vermont. I coordinated a project at Clark’s IGA years ago, involving the school in an art contest; continuing the project for about a year and a half. The usage of cloth bags went up considerably as I watched the numbers for awhile . I would like to spread this project throughout the state of Vermont, but need funding to actually get it off the ground. Karenna Gore is coming to Bennington on April 23 and I thought of her as a possible resource. I am also considering the support of local Vermont companies that are environmentally conscious. I have devised a Mission Statement and need to finish my Business Plan by the end of April. Do you think this plan is realistic considering the temperature of the economy and the environmental movement? I don’t know Karenna but will look her up. I have been gone from VT for 13 years now, and Londonderry for 15 years. But I do know that Matthew Mole (Burlington area) who is the son of Michael Mole (Landgrove / Londonderry) has been working in that issue area for at least a decade. Google him, and use my name if you think it will help. I remember being surprised when Chelsea Clark went to work for Howard Dean (do I remember this correctly?) and it gave me great faith in the ability of small towns to produce great, strong people. My first job in VT (1968) was at Clarks, packing groceries. It was a sad time (death of mother) but poignant. I have been through a similar experience here, in my sixties, meeting all kinds of people from the deep well of relationships we form as we go through the decades of life. This is where my mother’s family is from (250+ years). Twenty years ago, the expert in organic cotton was a woman named Sally (Mallon?) whom I visited in Arizona. She may still be around (we are all getting old) and might serve as a valuable contact / mentor. BTW, I especially like the use of “art-youth” to promote “greenness.” Consider it truly inspired…and had a great example this morning at the opening farmers market of the season in Charles Town WV (Google…just rotated off the board).